Brain Injuries generally occur suddenly and without warning. For those who have suffered a brain injury and their families, getting the right benefits can be essential to secure a regular income to meet the day to day cost of living, both in the short and long term. The welfare benefits system is undoubtedly complex; however it can provide support in relation to care and mobility as well as income, and families should consider applying as soon as possible because the process can be protracted. Statutory Sick Pay is available for a limited period for those that are still employed but unable to work. Employment and Support Allowance (ESA) is currently the primary benefit for those who are unable to work through illness or disability. Income Support (IS) is available in certain cases for those who have substantial caring responsibilities or have young children. Disability Living Allowance (DLA) is a benefit for children who have mobility problems or extra requirements for care. Attendance Allowance (AA) is available for those of state pension age who have care needs. Personal Independence Payment (PIP) has been introduced to replace DLA for new claimants of working age. 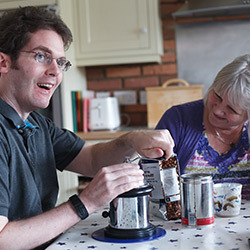 The qualifying criteria for PIP includes the effects of the condition, rather than the condition itself, and payments will be reviewed regularly. People of working age who currently receive DLA will be migrated to PIP; people over the age of 65 will continue to receive DLA/PIP as long as they qualify. Carer’s Allowance is paid to anyone who has substantial caring responsibilities for a person with a disability. There are certain qualifying criteria for the person providing the care and the individual being cared for. Housing and Council Tax Benefit are both means-tested benefits that contribute towards the cost of rent and Council Tax. Child Tax Credit is also available for those with dependant children up to a certain age. Universal Credit is being phased in to provide just one payment to cover a range of welfare benefits. It is expected to replace Jobseeker’s Allowance, Housing Benefit, Working Tax Credit, Child Tax Credit, Employment and Support Allowance and Income Support by 2022. The rates for benefits vary depending on your circumstances. There is a basic rate for individuals or couples and additional elements paid based on age, disability and dependant children. For those at the qualifying age for state retirement pension and on a low income, you may be eligible for the guarantee element of pension credit. The New State Pension was introduced for everyone reaching state pension age on or after 6 April 2016. This new benefit is aimed at simplifying the pension system. These are just an example of what may be available to you. Depending on your circumstances there may be extra help for mortgage relief, local authority care and certain NHS services. There is also support available for those who are working and on a low income in the form of Working Tax Credit.